It’s April. That means the year is young, but it’s not exactly new anymore. The ice left us over the weekend, and now it’s just soft water and sunshine as far as the eye can see. But that’s not entirely true, because it’s time for those April showers, the kind that are supposed to bring May flowers, but instead, often, only bring angst. It’s the in-between, not winter but not yet spring, and summer? Not even close. The market, man, the market. Just a few short months ago I was concerned about it. Because that’s what I do, I fret. I want to keep the market momentum moving forward, and if I was put in charge of this market, more so than I already am, I could keep it going for a long, long time. Like Bernanke or Yellen, I’d be able to give the market what it needs, and tell it what it wants to hear. Still, in early January I was concerned about 2019. Today, just three months later I’m still concerned, but the concern has shifted. When the year was young, I worried that the December stock market melt would negatively impact our markets. I worried that the recent Federal tax reform would hurt our vacation home market. And before I knew the specifics of his asinine proposal, I worried that JB’s envy driven tax plan would hurt us. Hate the man who has more than you, that’s the way that pitch went, and I worried. But then the market melted back up, and buyers showed no signs of letting up. Contracts flew. Even as this winter threw snow and sub-zero temperatures at us, contracts were written. Buyers, rather than being spooked by any sort of December equity selloff and the rhetoric of a populist governor, pushed forward with their goals. Those goals, by the way, are mostly singular: Enjoy life, while it’s still here to be enjoyed. And if that enjoyment hinges, as we know it does, on spending weekends in a different place where the beautiful people instinctively flock like the salmon of Capistrano, then so be it. Today, I see nothing but activity. The market is strong in every aspect imaginable. The upper end of the lakefront flexing its muscles with the pending sale at 389 North Lakeshore Drive ($7.395M). The middle market showing strength with recent offers in the South Shore Club and elsewhere. The entry level lakefront remaining devoid of inventory, excepting my pending lakefront on Park Drive ($2.195M). But beyond the lakefront, the activity is even more significant. Pending sales are everywhere, homes with slips, homes without slips. Lake access homes that might have been barely $400k a few years ago now pending over $600k. There is activity, ample, generous, sometimes confusing, activity. Abbey Springs is on fire, with 19 available homes and condominiums and at least nine of those under contract. At Abbey Hill, four available units and two of those are pending sale. In another big turn around, there is only one available unit at the Abbey Villas. If you look back several years, you’ll read me lamenting the state of the market there. Lament no longer. The lakefront condo market is effectively locked down, with just three available condo units as of this morning. The best among those is my $799k Bay Colony listing, but you already knew that. The picture is above, in case you forgot how great it was. There are pending sales at Bay Colony and Vista Del Lago, and a recently closed condo at the Old Boatyard around $800k. You can see, whatever worries I had in January have been eased with this wild dose of market activity. But don’t think I’m not without worry, because I’ll always find something to worry about. It’s called creative anxiety, in case you didn’t know. Now my worry is placed back on the side of inventory. If we don’t keep stoking this fire, it might burn itself out. The best medicine for our market now is a steady supply of inventory, and with the things I’m currently working on, I think we’re going to be able to feed that need as well. Which will force me to worry about other, more important things, like how on earth I’m going to lose 30 pounds before summer. Some would say that title is impossible. After all, load into a tour boat and take a trip around these shores and there’s very little that looks particularly affordable. Even the homes that look affordable come with seven figure asking prices, albeit low seven figures. Lake Geneva has historically been home to significant wealth, and the trend in recent years has only accelerated that status. Several years ago a $10,000,000 home on this lake was viewed as a fortunate albatross. It was neat, and lavish, but it didn’t make any particular sense, even for the wealthy. Today, a $10,000,000 home would be met with immediate buyer interest, as the liquidity that traditionally dried up around $5,000,000 now meets little resistance up to and through double that amount. Yes, Lake Geneva is for the wealthy, everyone knows that. But that’s not where the story ends. Because Lake Geneva isn’t just for hedge fund managers and successful entrepreneurs. It’s for anyone who desires something different. It’s for everyone who wakes up on a Saturday morning in the summer and wonders what they’re going to do that day. It’s for those who are stuck in traffic on a Friday night, but not in the northbound lanes. It’s for those with the means to change their weekends and change their motivations, even if that doesn’t allow for a lakefront home or a lavish off-water spread. Yes, you could buy a cottage in one of our area towns for $80k and use that for your summer house. That’s perfectly acceptable, and encouraged. But let’s assume you’re not looking to buy squalor. Let’s assume you want something easy, something low effort, something large enough to contain your family and/or friends in some form of luxury. If you’re thinking I’m going to suggest a tiny home, please read this bit on the folly of the tiny home. No, I’m suggesting a condo. A simple, easy, two or three bedroom condo. Something affordable. Something in the scene. Something that allows a weekend to be entirely and completely different from the 9-5. If you’re looking at Lake Geneva, as you should be, these condos have names and well defined price brackets. If you can spend $180-250k, you’re in luck. Lake Geneva has sensible, stylish options for you, too. I’ve written about this particular segment often, because it deserves inclusion in any vacation home discussion. The condominiums that I find appealing in this segment include Abbey Hill, Abbey Villas, and Willabay. There are others, for sure, but these are the three that fit into this lower price point while still offering some meaningful value. When times were bad, these small condo associations were chock full of inventory. Too much inventory, some slight foreclosure activity, and overall malaise. Today, these complexes have recovered completely, and they offer some of the easiest value in our broad market. Let’s take a look at each one to see what’s happening. Abbey Hill is perhaps my favorite. The complex isn’t right in town, like the Villas, but I appreciate the privacy. There’s a basic swimming pool and some nice topography here, all less than a mile from downtown Fontana. Today three units are available, priced from $199k to $255k. One of those three units is pending sale. The condo fees at Abbey Hill are around $350 monthly, and taxes run around $3k annually. Factor in a 70% mortgage and you’re looking at a delightful vacation home for the cost of one long weekend rental at the Abbey Resort. Best of all, the units are all a bit tired, so a basic surface renovation can make a dramatic impact. The Abbey Villas are adjacent the Abbey Resort on the harbor. That harbor is being renovated this off-season, so look forward to a beautiful new harbor (if there is such a thing) by next summer. The villas have a series of swimming pools, and are undeniably in the heart of the action. The beach, restaurants, and parks are all just a short walk from these units. Inventory swelled during the crisis, but today there are just two units available in the MLS, priced from $230-272k. Some units here can sell into the $400s, if they are harbor front. Taxes are similar to Abbey Hill, though assessments are a bit higher. Pets are not permitted here, so if you hate dogs and cats, you’re in luck. In Williams Bay, Willabay fits into this particular segment. If you like being close to the water (short walk), but dislike the bustle of Fontana on a summer weekend, then Willabay might be a better fit. There’s a pool here and some tennis courts, all close to the Williams Bay lakefront and beach. There are five available units priced between $179-235k, with one unit pending sale. Taxes are similar to the Fontana units, and assessments are, on average, a bit lower than Abbey Hill. These units come with one car attached garages, as do most of the Abbey Hill units (the Villas lack garages). If you love the Lake Geneva scene, and you’d like to be part of it, I’d gladly sell you a $5,000,000 lakefront house. I’d be happy to, really. But if that’s not in the budget, and a $200k condo near-ish the lake sounds more appealing, just let me know. You have solid options here, and I’m happy to guide you to the best value. This summer, the activity in the single family market has been well documented. In fact, it’s been documented to death. Bludgeoned with exclamation marks. Cause of death? Overuse of hyperbole. But still, the market is hot and so we recognize that. We’re grateful for it. The thing is, each market is connected, each segment joined to the price range above and below it. Each style of property hinging somewhat on the performance and inventory in the adjacent market created by a different type of property. If the vacation home segment of $250k single family homes is hot and low on inventory, then the vacation condo market in the same price range should be equally as hot, right? The vacation condominium market is dominated here by the two large players- Abbey Springs and Geneva National. But these resort developments are so large they actually operate as their own individual markets, with little carry over from the single family market and other smaller condo developments. Strange as it may be, a $650k house in Geneva National does not benefit from the strength of the $650k lake access market. When I was a seller in GN I would always find reason to complain about this lack of correlation. It felt unfair, but I learned to accept it and have only harbored resentment and bitterness ever since. The two condo markets that would most directly benefit from the entry level lake access activity are the Abbey Villas and Abbey Hill. Both are in Fontana, where the heart of our lake access market resides. This morning there are only two single family homes with lake access priced below $300k in Fontana. That’s an incredible drought of inventory, and at this date in July it’s unlikely the inventory deficit is corrected before the year ends. If the single family market in Fontana is starved of inventory, then the two condo markets that feature units under $300k should be hot, right? Well, sort of. Abbey Hill has two available condo units this morning priced from $225-255k. There haven’t been any sales in Abbey Hill for 2017 (MLS), following a 2016 wherein two units closed. Abbey Hill, for the uninitiated, is up the road a mile or so from the Fontana beach. It’s an older condo complex that won’t win any particular architecture awards for the overall complex, but the individual units are quite interesting. I’ve long appreciated the Abbey Hill condominiums for their character, and I don’t expect that fondness to change anytime soon. The units are cool, and if I’m a buyer in the $200s looking for a lake-based weekend, I’m paying Abbey Hill a visit. The other Fontana property that should be directly tied to the single family market is the Abbey Villa. This is not to be confused with the Abbey hotel condominiums, which are different and, in my opinion, not a good idea. The Abbey Villas have had some difficulty over the last market cycle, but today the recovery seems complete. Last year there were 10 sales in the Villas, closed between $165k and $255k. 2017 had has five closings YTD, all priced between $216k and $260k. There is currently just one unit available at the Villas, priced in the mid $200s. The Abbey Villas have completely and thoroughly recovered, and for that, we can all be pleased. Two condo markets, both in Fontana, both tied directly to the single family vacation home market. Both performing quite well, as they should be. If you’re a buyer looking for a sub $300k lake home, consider these condos. Specifically, consider the Abbey Hill units. They’re affordable to own and I don’t think there’s a better value in the Fontana market. As always, let me know if I can help. Fontana aerial courtesy Matt Mason Photography. That’s a clunky headline, to be certain. But clunky it must be, because there’s really no other way to describe this segment of our market. It isn’t Abbey Springs. It isn’t Geneva National (those two updates will be this coming Friday and then Monday). It’s just the secondary vacation home condominium markets that cater to the secondary homeowner. The sorts of folks who buy into these developments are those who seek a piece of this scene, but they wish to join for a fraction of the membership fee required by the other market segments. When swimming in the lake on a hot July afternoon, there is no distinction between the lakefront owner who paid $5MM and the Abbey Hill condo owner who paid $200k. I consider this market to include the following condo associations: Willabay Shores, Bayside Pointe, Abbey Villas, and Abbey Hill. There are other such condominiums, but these are the developments that I find most appealing for the vacation home buyer seeking to spend somewhere around $200k. These are the associations that I would be considering if I were a buyer in that range. We know that 2016 was a year with incredibly low interest rates and a mostly stable (excepting the first 60 days of the year) stock market. Because of those conditions, this entry level condo market should have had a very solid 2016. And that’s exactly what happened. Bayside Pointe is in Williams Bay. It’s nice, and it’s walking distance to the lake, and the units have small attached garages and there’s a swimming pool. You can also walk to Bell’s store, though I’ve never heard that written in a description as an amenity that carries any particular weight. Five units sold here last year, with closings at $185k on the low end and $260k on the high end. There wasn’t a single sale in this complex for 2015 (per MLS), and as of today there is just one active ($184,900). While I generally find myself concerned about inventory at the higher ends of our market, the best possible scenario for current owners in these sorts of associations is to see very little inventory. These markets exist in a vacuum of sorts, as sales at Bayside Pointe really only matter to Bayside Pointe, just as Willabay sales only matter to Willabay. There is little crossover here. The inventory is now low, which is difficult for buyers but fantastic for current owners. 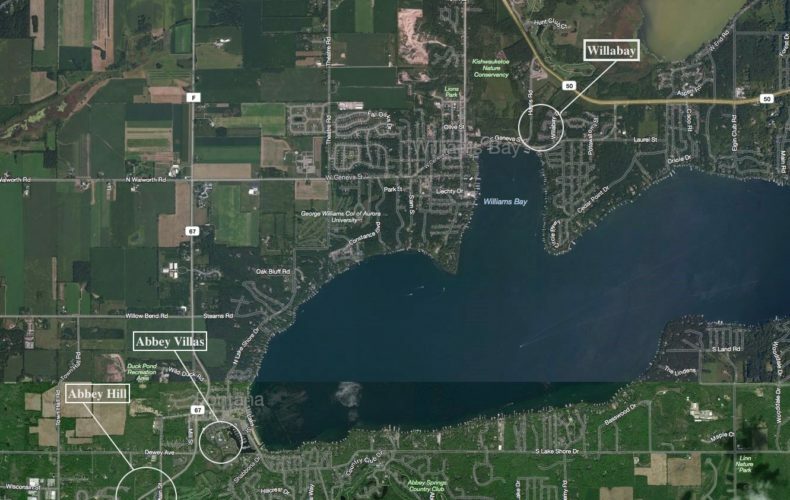 Willabay Shores is just down the road, closer to the lake. It’s walking distance to the water, and it’s walking distance to the little stream that pushes through the Williams Bay beach where I first discovered Snapping Turtles. Willabay sold 11 units in 2016, nearly double the 2015 production of six. Currently, there are just three active units per the MLS, which again, creates a fantastic climate for current owners. In all, a remarkable 2016 for Willabay. Prices ranged from $130k to $217k, which is the typical range here, though some units with slight lake views can push upwards of $275k. In Fontana, Abbey Hill has long been one of my favorites. It lacks the proximity to the lake that these other developments can claim, but the architecture is unique and I find it to be rather engaging. There were two sales in 2016, down from four total in 2015. But this isn’t a problem, it’s just a function of lower inventory. Currently, not a single Abbey Hill unit is offered for sale on our MLS. Again, that’s not wonderful news for buyers looking to consider Abbey Hill, but it is the perfect climate for existing owners to discover some appreciation. Don’t forget about Abbey Hill- if you’re a buyer in the $200k range seeking some sort of Lake Geneva vacation home, you should be asking me about Abbey Hill. If you like Fontana but need to be closer to the scene, then the Abbey Villas are for you. The development doesn’t allow dogs, so that’s tough on some people, but the development is close to the beach and you can walk to your morning coffee, and that’s something. 10 units sold here in 2016, with closings occurring from $165k to $255k. No harbor front units sold in 2016. The 2015 volume stalled at six total sales, so 2016 is a win no matter how you look at it. Today, the inventory is following the same pattern as our other market participants, with just two units available in the MLS, and one more pending. The Abbey has the highest association dues of any of these properties, so that’s something to consider if you’re looking to vacation on a relative budget. Vicki Hansen is my assistant who handles all of these associations for me, and if you’re a buyer or a seller, there’s no better choice for representation. Buyers tend to shy away from Lake Geneva if they find their budget doesn’t match up with our lofty lakefront prices, but those who wish to find themselves part of our scene for $200k or so would do well to discover these four associations. Expect 2017 to be a solid year, but as with our current prediction theme, if inventory doesn’t build then we’ll see more appreciation this year, and less overall volume. Image courtesy Matt Mason Photography, a Lake Geneva wedding photographer. Take to the highways and county roads this summer and you’ll notice plenty of things. You’ll notice that semi drivers often change lanes with relatively little warning, which is especially rude when I’m in the middle of writing a lengthy email. I’m beginning to think it’s not just texting and driving that’s dangerous, but also emailing and driving. Perhaps the public awareness campaigns will tweak their message. You’ll also notice motorcycles. I’m afraid of motorcycles, I admit it. My dad told me once that a motorcycle driver took a corner too fast near some house he lived in when he was a child. He said he had to go in the house to get towels and sheets to help his mom mop up the blood from the street. I find this to be implausible, completely and utterly so. There’s no way you’d worry about mopping up the street especially if rain was in the forecast. You’ll also notice campers and RVs and tow behind camping apparatuses. The world goes camping, even if we don’t. There’s something else that’s common on these roads in this season and in the cars, trucks, and SUVs that are towing these camping things: The occupants of the car are generally in a fair mood. They’re going camping, with that pop up camper thing, and they’re happy about it. They’re driving someplace far, or someplace near, but they’re going to get there and then they’re going to set up their camper and they’re going to pop open their folding lawn chairs and they’re going to eat hotdogs around the fire. When night falls, they’re going to sleep in that camper, mom and dad in the bed part that sticks out over the bed of the truck, and the kids somewhere else. I’ve never been in one of these camper things, so I’m just imagining how it all works. But regardless of the cramped quarters, the lack of finesse, these people who do these things are content. They’re content because they’re getting away from their weekday lives and living differently, if only for awhile until the time comes to pay the park attendant the weekend rent and fold the camper back to its traveling form. I’m never going to camp like this. Odds are, neither are you. But we can do things like this in a more comfortable way, and we can do them affordably. For every $7MM listing that Lake Geneva can offer you, there are 20 $189k vacation condos. For every $800k association home with a boatstlip there are five $220k association homes with lake access. This is a market for the affluent, sure, but it’s a market for anyone who has a few extra dollars of disposable income and a feverish desire to get out of town on the weekends. Lake Geneva has always been the place, but it’s not just the place for business icons and those of affluence, it’s for everyone who wants to make a few sacrifices and spend their weekends living in a different place, in a different way, just like those happy campers who clog up in the interstate. Along those lines, consider the economical Lake Geneva vacation condominium. I have some rules for this sort of purchase, and it includes avoiding condo-tels, because those are ridiculous. You’re also not allowed to buy some condo in some absurd setting, like the condos that were created in the part of Williams Bay best left for lower value housing and commercial buildings. So let’s look at the condo market, and consider where you should be considering. Willabay Shores, this is an easy one. Priced from the painfully low $130s up through the $250s, these are simple two and three bedroom condominiums. They’re not new, so be ready to do some updating, but they’re walkable to the lake and the Williams Bay beach, and they have a pool and tennis courts and one car garages. You’ll feel part of the scene here, because you are part of the scene. Grab a fishing pole and walk across to the piers to fish. It’s terrific fun, and Willabay is still cheap. Bayside Pointe is just up the road from Willabay, a bit farther from the water but still close. The units are newer, larger, so if you’re looking for newer and larger and you’re in the $200-300k price range, these are worth a look. You won’t get any lake access with Willabay or Bayside Point, but you’ll be close. Can you tell that proximity matters? Walking distance to the lake is a good thing, and you should want it. Unless you’re considering Geneva National, in which case you’re not walking distance to any lake (Como doesn’t count in this context), but you’re tucked inside a beautiful enclave with what I deem to be the finest golf in the area. You needn’t be a golfer to vacation here, because who could hate beautifully manicured lawns, even if there are small holes with flags sticking out of them every so often? 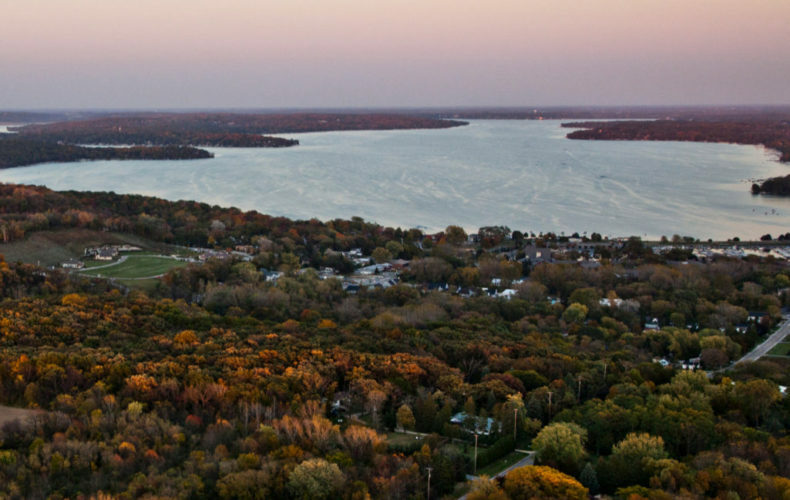 If you’re a buyer in the $100-$300k range and you’re looking for a Lake Geneva vacation home, Geneva National should probably be the first place you consider. I have two condos in GN in this entry level range pending, and the buyers are making wise decisions. The values are still depressed, so there’s still value to be found. 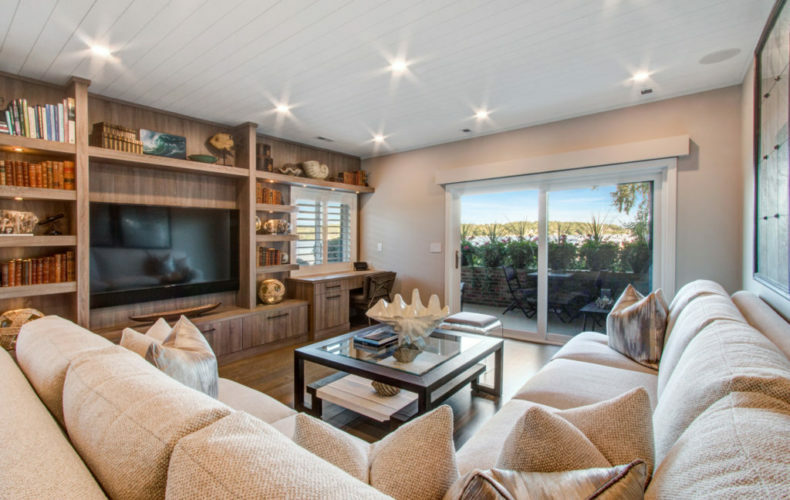 Yes, the market there is subject to some tumult, but you won’t mind so much when you’re living large in a very affordable vacation home. In Fontana, affordability is nicely intertwined with the extremely unaffordable. In town, you can buy a condo for $700k. Or you can buy an Abbey Villa between $199-$299k. The villas are older, so they’re not huge and they’re not particularly high end (unless you find a renovated unit), but they will get you into the Fontana scene on the cheap. They’re sort of part of the hotel but mostly not part of the hotel, but you have pools to use and the beach a short walk away. You can’t bring your pets to the villas, so if you need to bring Fido each weekend, the villas won’t work. If you need to bring your dog, consider Abbey Hill. A bit farther from the lake, but still close to the scene. The units here are diverse, interesting, and I’ve always liked this place. In the $200-300k range, there’s no better option in Fontana. Abbey Springs might take offense to that statement, and if they did they’d have a point. Want the whole scene in one development? The tennis, the golf, the pools, the beach, the restaurants, etc and etc? Then Abbey Springs is for you. Units between $140k and $350k offer a bit of everything, including some very odd floor plans. The designs are a bit haphazard, but they’re also fun and quite effective. I’d be considering Abbey Springs if I wanted an amenity packed association in the heart of the Lake Geneva scene. 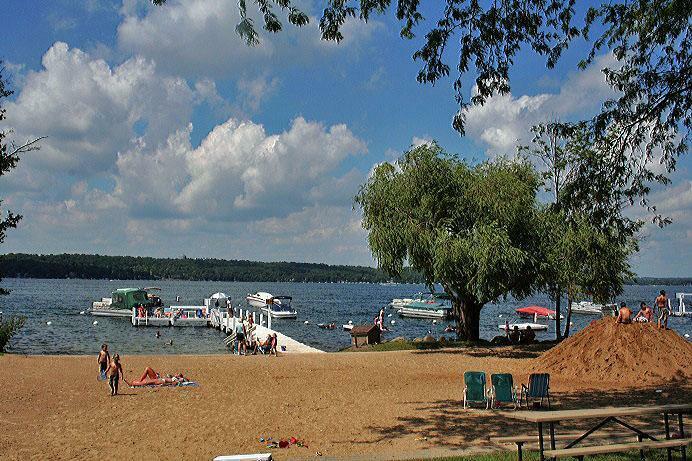 If you’re looking for an affordable weekend retreat, skip the camper and the packing and the cramped sleeping arrangements, and just talk to me about a Lake Geneva vacation condominium in one of these terrific associations.